Living space: 75 square meters. Rooms: 2 separatly bedrooms each with private bathroom + american kitchen. Capacity up 6 people. 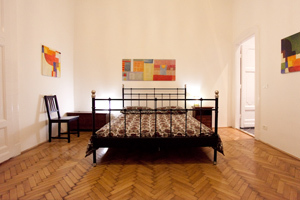 Amenities: This very nice apartment is it in next to Blaha Lujza square. (fridge, microwave, cooking, pots, plates and dishes, coffee machine. 2 Bathrooms with shower, washing machine, hairdryer, iron and ironing board. TV with international channels and free Wi-Fi connection. Two double beds and two single beds. Are provided for you bed linen, towels, free maps. -Public transportation: Ferihegy International Airport: Reptér (Airport) bus to Köbánya-Kispest -> Metro3 (blue line) to Ferenc korut -> take tram NR.4 or 6 direction Széll Kalman square and to get off in Blaha Lujza square and walk 200 meters.